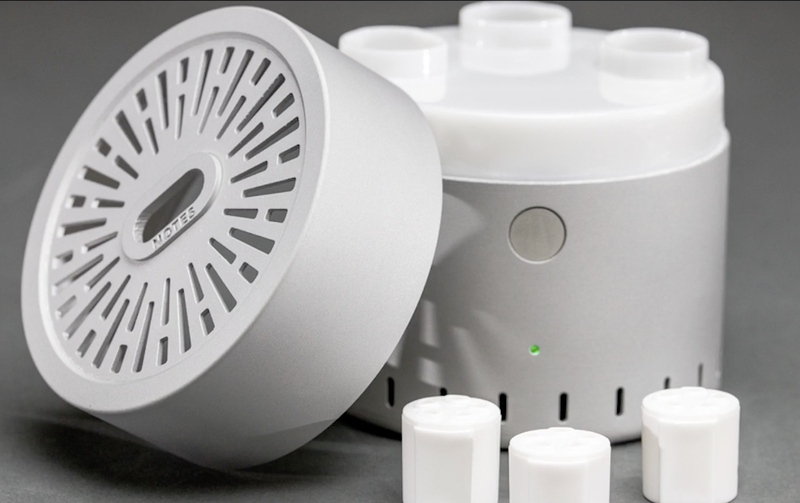 Cyrano is the first digital scent player in the world. It was conceived by Harvard Professor David Edwards and his student Rachel Field at Harvard University. Using themed cartridges, the user can program and play a series of scents from a smartphone. Smell is a powerful sense that is tied directly to the brain, so with more control of the scents around them, users can better influence their feelings and moods. Devlin Design was hired to further develop the industrial design and engineer the product for production. The team decided on a stamped metal exterior that allowed for purity of form, beautiful finish, and quality feel. Devlin created the unique grill theme and tweaked the design for optimal air flow. Cyrano was selected for the exhibition at the Smithsonian Cooper-Hewitt Museum in New York called "The Senses: Design Beyond Vision” which ran from April-October 2018. Although Cyrano was among over one hundred other much larger objects on display, the New York Times featured it prominently in the first paragraph of the exhibit review. It is also featured in the exhibit book and is now part of the permanent collection. Devlin Design continues to develop products with David Edwards, who is based at La Laboratoire in Kendall Square, along with Cafe Art and Science, where they continually explore collaborations between art and science relating to the human experience.